The Search is on for Diwata ng Matutum 2013! The 2013 Mt. Matutum Amyak Maleh and Linggo ng Mt. 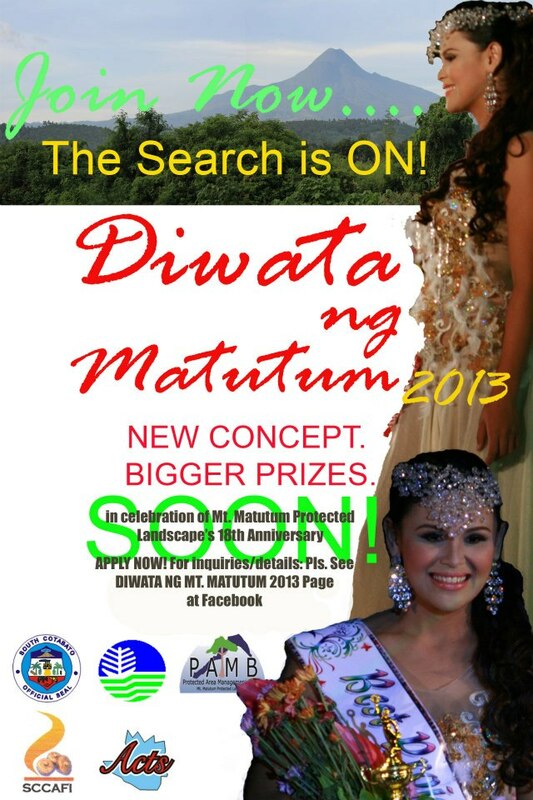 Matutum is still months away on March but organizers of one of its highlights - the Diwata ng Matutum Beauty Pageant have already began their lookout for probable candidates for a bigger and more prestigious staging this year. Diwata ng Matutum is a SOCCSKSARGEN-wide search which aims to promote environmental awareness and conservation advocacy for Mt. Matutum. This year, it is in lined with the 18th anniversary celebration of Mt.Matutum as Protected Landscape and "Linggo ng Matutum".